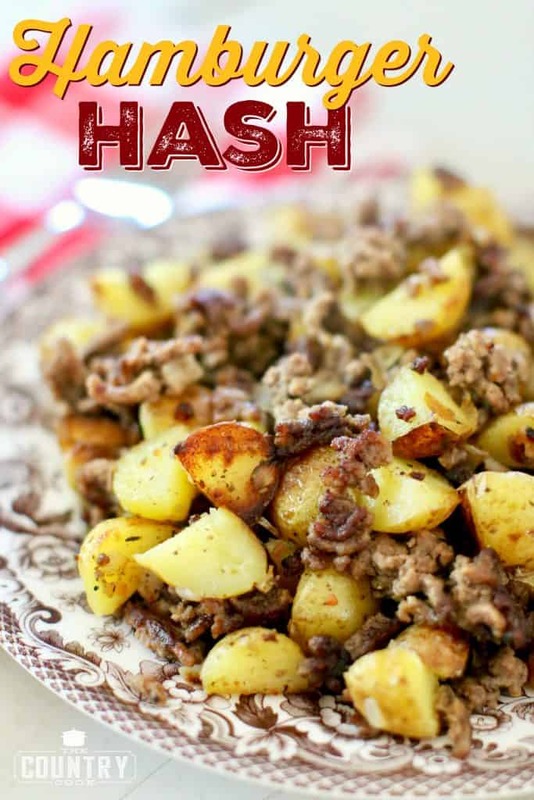 I used to love “hashes” when I was younger. I realized recently that I haven’t made it in a long while. 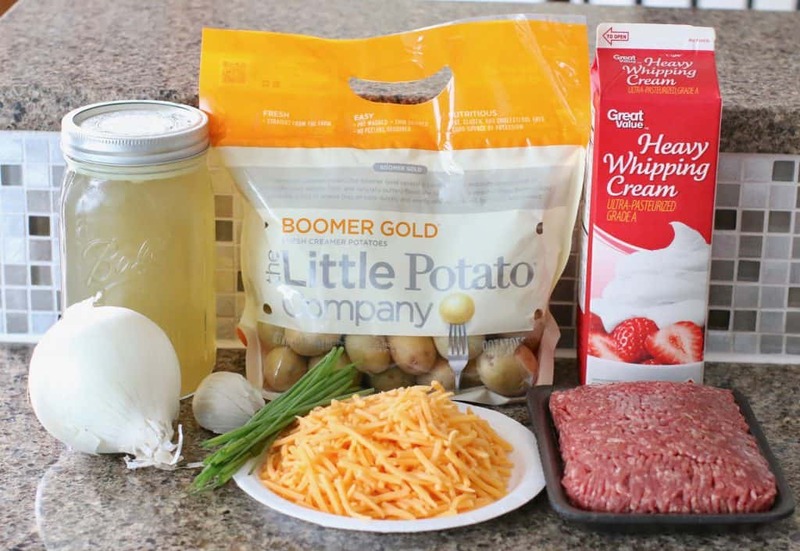 We usually made hamburger hash or corned beef hash which is just chopped meat, diced potatoes and seasoning all cooked up in a skillet. It’s easy and budget-friendly. Simple food that is filling. So, I figured, why not take that idea and put it in a soup? 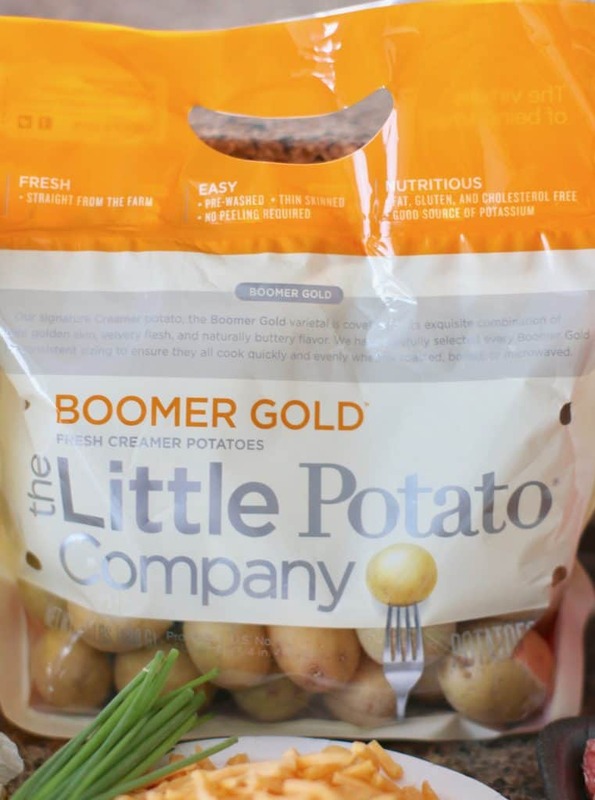 I had about two bags of these Boomer Gold Little Potatoes. They are creamer potatoes (not baby potatoes) that have a perfect creamy and butter-y texture. They are already pre-washed and the skin is thin so no peeling required. And as a bonus, they are nutritious as well as gluten free and cholesterol free and a great source of potassium. I knew they would work perfectly in this soup. 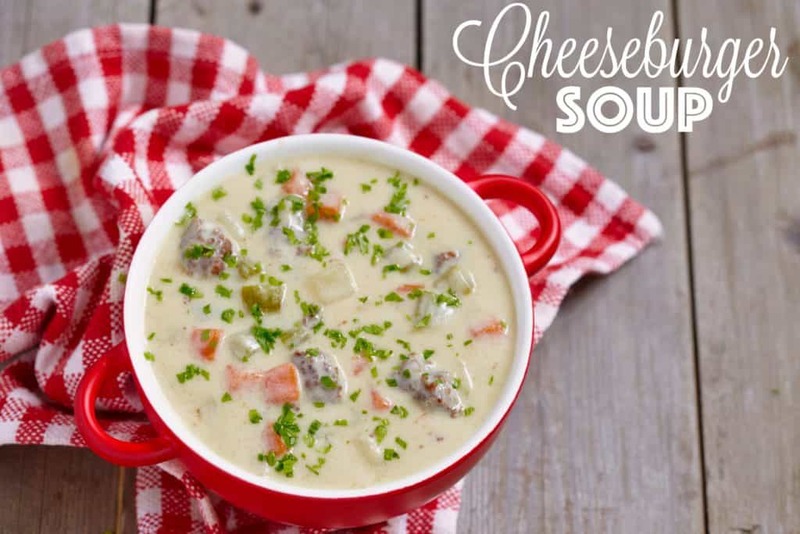 I really, really, love thick and creamy chowder-like soups. But this soup is totally customizable to how thick or thin you want it (see my notes below). Now, let’s get to this delicious, rib-sticking soup! It’s a one-pot meal that is perfect for those autumn days ahead. I think this is wonderful with a yummy salad and maybe some crusty bread slathered with butter. Heaven in a bowl! Cook’s Notes: I recently made some homemade chicken stock but that is not necessary for this dish. Just use your favorite store-bought stock. I think stock has more flavor than broth so if you can find that in your grocery store, it will work great. 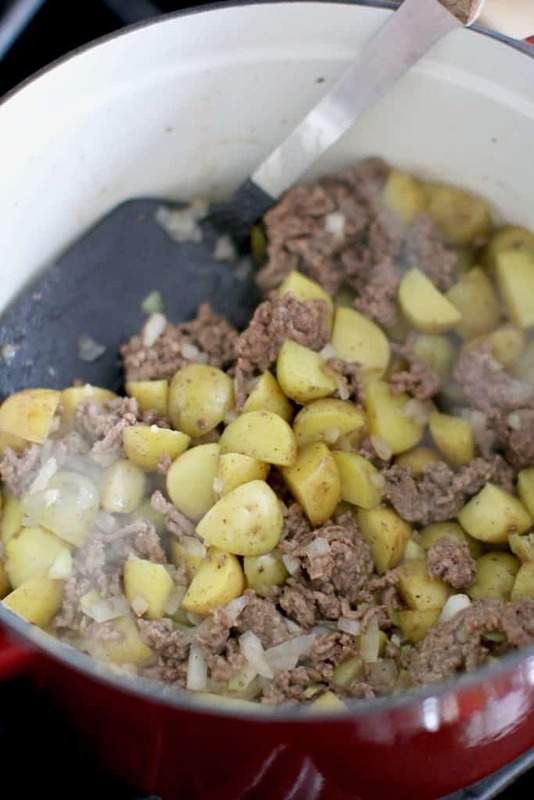 In a large dutch oven (pot), brown ground beef along with diced Little Potatoes, diced onion and minced garlic. Season generously with salt and pepper. 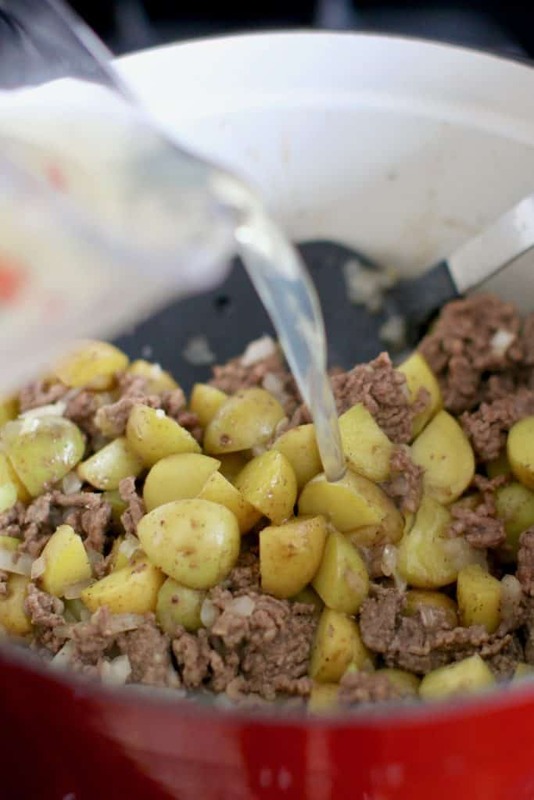 Once beef is browned and crumbled, drain off any excess grease. Then pour in chicken stock. 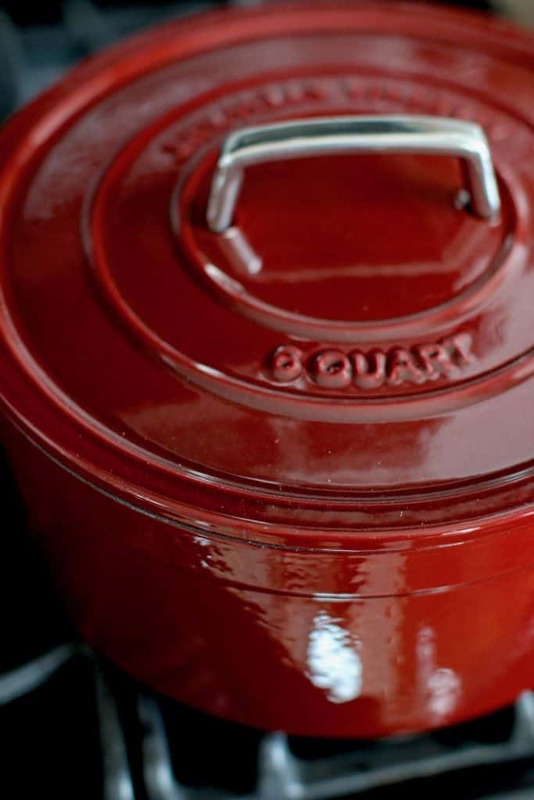 Cover and turn heat down to medium-low. Allow soup to simmer for about 15 minutes (until potatoes are fork tender). 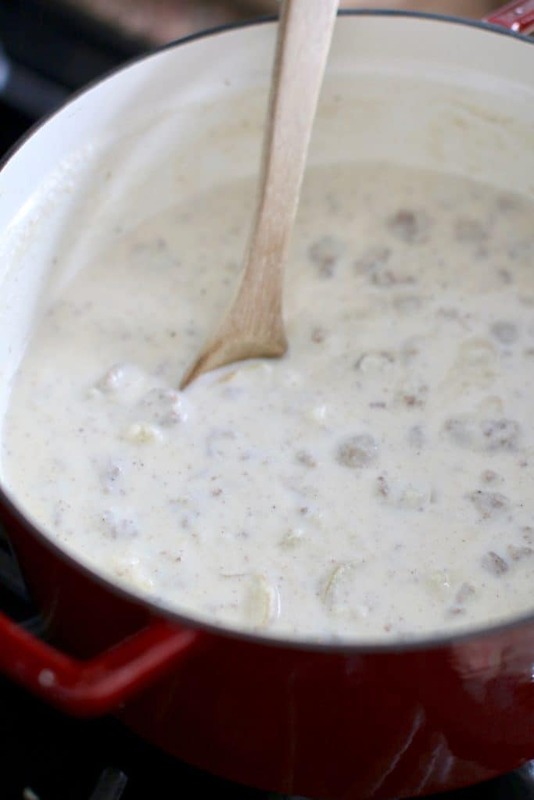 Then pour in heavy cream and stir. This next part is optional and depends on how thick you like your soup. 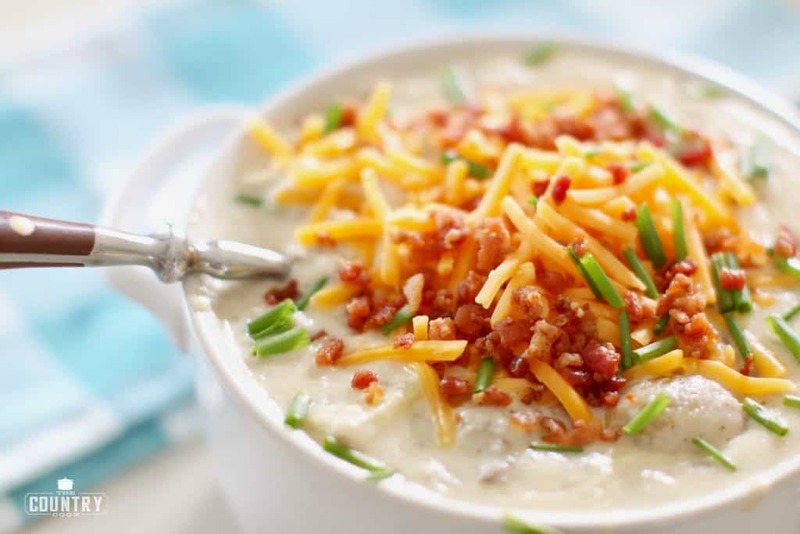 I really enjoy thick, chowder-like soups so I will add in about 1/2 cup of instant mashed potatoes. Stir and allow soup to simmer on low heat, covered, for about 10 minutes. 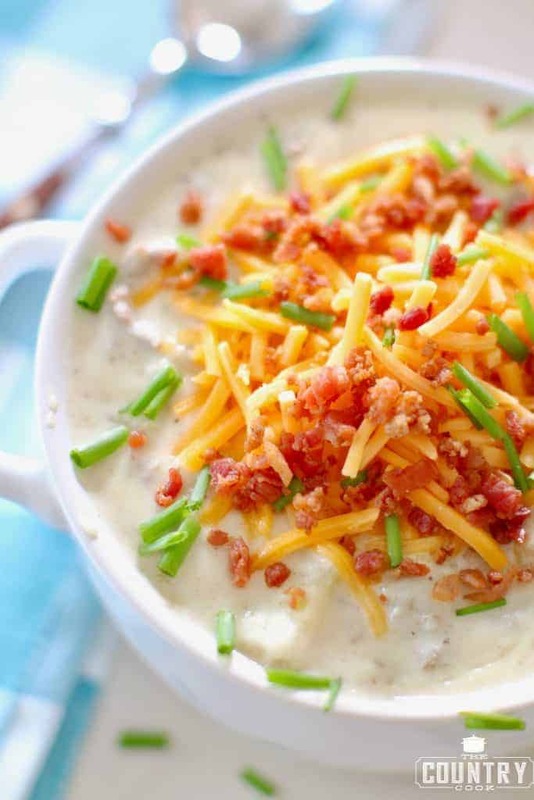 You can always add more of the instant mashed potatoes if you want it even thicker. Also, do a taste test at this point (careful – it’s hot!) I always think it needs more salt and pepper. Just keep adding a little and then tasting until you get it just right. Finally, top with shredded cheese, chives and bacon pieces. Serve with a side of crusty bread. This next part is optional and depends on how thick you like your soup. 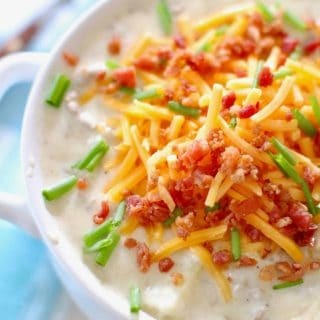 I really enjoy thick, chowder-like soups so I will add in about 1/2 cup of instant mashed potatoes. Stir and allow soup to simmer on low heat, covered, for about 10 minutes. 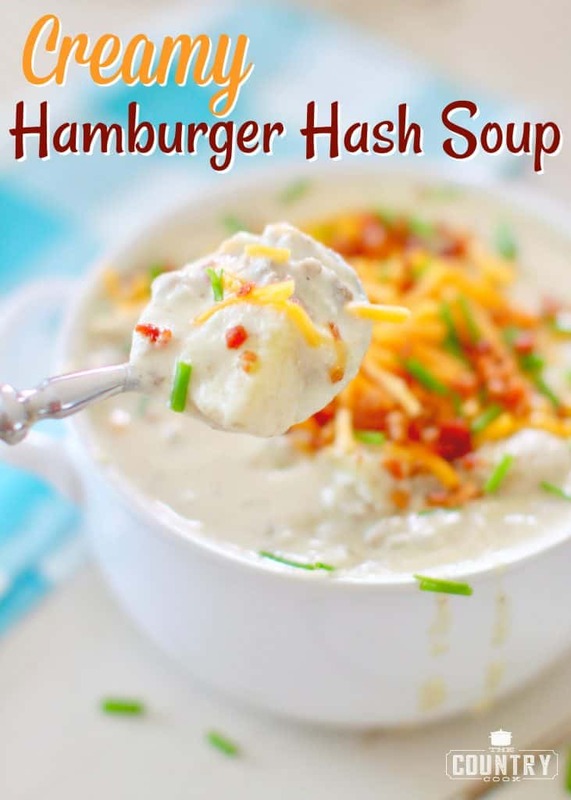 You can always add more of the instant mashed potatoes if you want it even thicker. Do a taste test. I usually find it needs more salt and pepper. Just keep adding a little, then tasting, until you get it just right. Finally, top each serving with shredded cheese, chives and bacon pieces. Thanks for your wonderful emails and recipes. I have an enormous file of them and cook many of your recipes. My four guys love it all! Hi Paula! Awww -wow – thank you! That really means so much! This should be just fine in the crock pot as long as you just keep it on the “warm” or “buffet” setting. If you keep it on the low setting, it’ll just keep cooking away. But the warm setting will be just fine! You should only have to give it a little stir when you get home. 🙂 Hope everyone loves it! I made the soup and found it quick and easy to make. I am a self confessed spice wimp but even I thought it needed something. I think I may try seasoned salt or some garlic next time. Hi Lisa! Hmmm..garlic is already in the recipe. Did you use it? Also, I do mention a couple of times in the directions to taste for additional salt and pepper as it cooks. I always find it needs more than I think. And don’t forget about those yummy chives and cheese as a topping. Makes a big difference too! 🙂 Hope that helps! 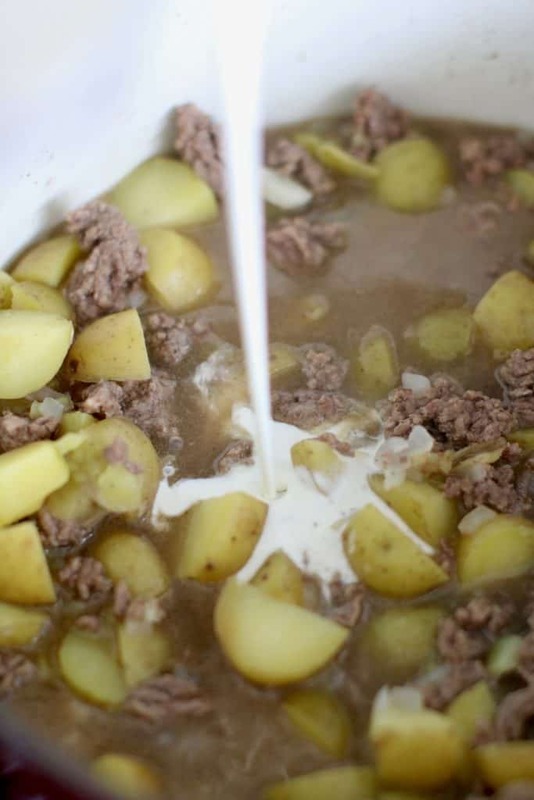 Do you have a recipe for beef-barley soup? Hi Evelyn! No, sorry I don’t.